An attack on a police station and a military post in Mocimboa da Praia, a town on the coast of northern Mozambique’s Cabo Delgado province in October 2017, by an unnamed armed group resulted in the death of two policemen (Voice of America, 11 June 2018). Since that time, the previously untroubled Cabo Delgado has been the site of a surge in violent activity. Much of the escalation in activity is attributable to Ahlu Sunna Wal Jamaa (ASWJ). Though the group’s membership and motives are largely unknown, its effects are easily observable. 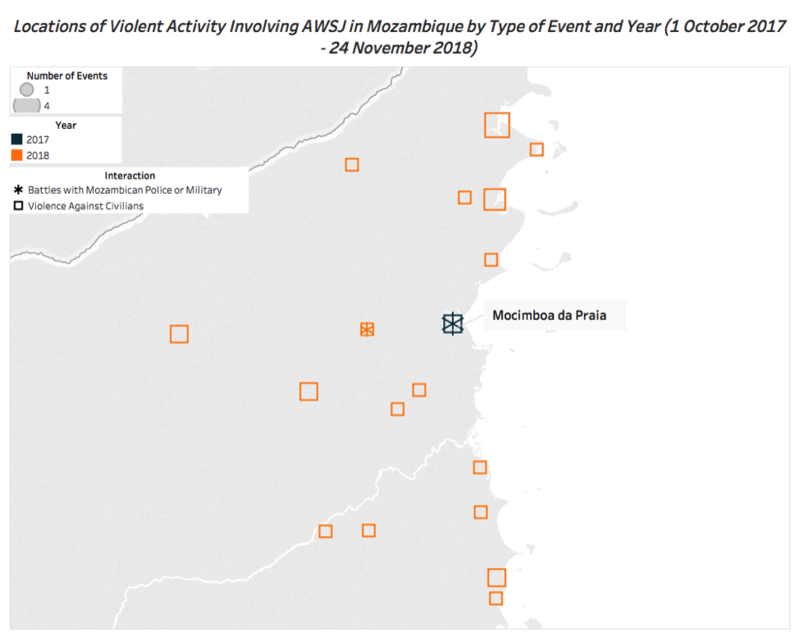 In 2018 thus far, there have been 37 violent events involving the group, including clashes with the Mozambican security sector as it has attempted to quell the insurgents. The pattern of violence in Cabo Delgado in 2018 suggests that ASWJ is using violence against civilians to create new frontlines in the conflict. In 2018, ASWJ has expanded its geographic scope of operations and increased its targeting of civilians. The group’s emergence has occurred in a space of significant economic deprivation. Further, instability resulting from the group’s attacks threatens to stall or scrap plans to develop the country’s natural gas reserves. The Mozambican government must proceed cautiously in responding to the insecurity, as mishandling the insurgency could escalate the crisis further. The emergence of ASWJ has been accompanied by a host of rumors about the group. At the time of the initial attack on October 2017, a number of media outlets emphasized that locals referred to the militants as “al Shabaab.” Despite this nickname, the general consensus is that “the group is not known to maintain meaningful ties with international jihadist networks” (Ake Group, 11 July 2018). The group’s ideological bend is also unclear; despite having an Arabic name with Islamic significance, “interviews in Cabo Delgado with religious leaders, local police and youths conducted between November 2017 and February 2018 confirm that the group is mainly motivated by criminal activities rather than Islamic ideology” (Assaye Risk, 30 August 2018). This assessment also concluded that the group lacks a centralized and influential leadership. Interviews with residents of Cabo Delgado often suggest that the group is comprised of locals, rather than foreigners or Mozambicans from other areas (MSN, 13 June 2018). Though information about the group has emerged over the past year, it remains poorly understood. The emergence of ASWJ has occurred in a space of significant economic marginalization. The Human Development Index regards Cabo Delgado as the least developed in Mozambique (Global Data Lab, 2017). The difficult living conditions of Cabo Delgado’s residents is further underlined by the international investment that has been directed to the region since the discovery of vast natural gas reserves that could make Mozambique a significant exporter of natural gas to the global market (Financial Times, 27 June 2018). Developing the capacity to extract and export the estimated 180 trillion cubic feet of natural gas has brought billions of dollars of investment into the region (News24, 24 June 2018). This investment has also been accompanied by the relocation of 500 families and a number of foreign workers, contributing to anxiety among the residents of Cabo Delgado (Financial Times, 27 June 2018; World Oil, 23 July 2018). Though ASWJ has not yet targeted any natural gas infrastructure nor any foreign workers associated with the projects, the instability has affected efforts to develop the natural gas reserves. The insecurity has resulted in delays for Wentworth Reserves’ initial exploration efforts and was significant enough to prompt Anadarko, “the largest exploration company in the region,” to temporarily suspend its activities (News24, June 24, 2018). The Mozambican government has painted the militants as anti-development; President Nyusi declared that the armed group has “been given orders by people who don’t want the development of this country and this province” (Reuters, 3 October 2018). Though ASWJ has only been active in Mozambique for a little over a year, it has already undertaken a number of significant tactical shifts. Notably, ASWJ has expanded geographically and shifted the target of its attacks. Since the October 2017 attack in Mocimboa da Praia, ASWJ has expanded the geographic scope of its operations to more than 20 locations in Cabo Delgado. The areas where the group has been active, and what types of activities they have been involved in at each location, are illustrated below. The peak of the group’s geographic expanse was the second quarter of 2018, when it was active in 14 locations across Cabo Delgado; the areas in which ASWJ engaged in violent activities shrunk to 5 in the third quarter. The expansion in the locations in which ASWJ was active coincided with an increase in the number of clashes with government security forces, as illustrated below. 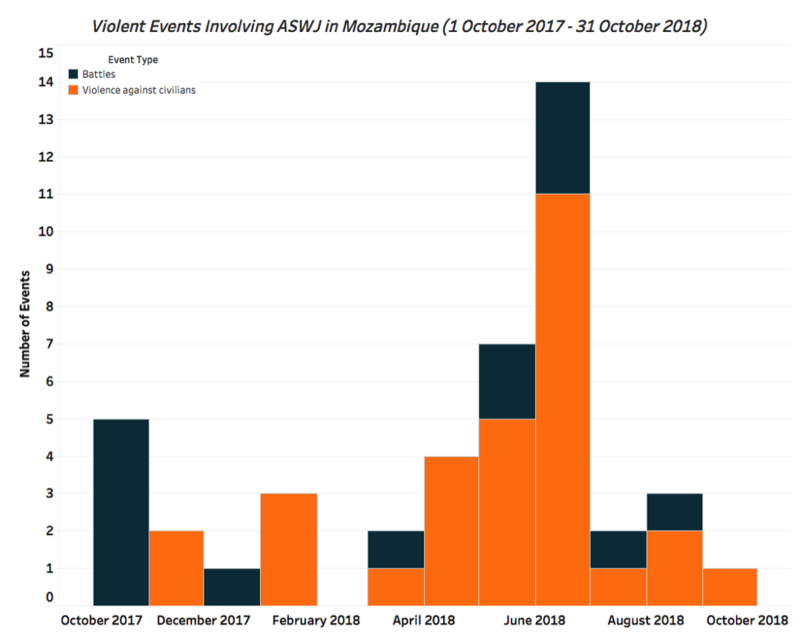 In the second quarter of 2018, there were 5 violent clashes between ASWJ and the Mozambican government. 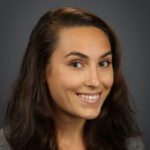 There were only 7 such events recorded in the 7 months prior, five of which were recorded in October 2017. It’s clear that the government has focused most of attention on Mocimboa da Praia, as depicted in the image above. In addition to the geographic expansion of activities, ASWJ has also demonstrated a shift towards the targeting of civilians. In May and June 2018 there was a surge in the targeting of civilians by ASWJ. This may be tied to the increased number of confrontations with the government in this period. Since May 2018, when the government’s security forces and ASWJ clashed for the first time in 2018, there have been 21 instances of targeting of civilians by ASWJ. This pattern of geographic expansion and civilian targeting suggests that ASWJ is attempting to open up new frontlines in the conflict (Raleigh, 2012). This violence against civilians has often been particularly gruesome, including instances of beheadings that attracted international media attention and resulted in nearly 190 people being put on trial in October 2018 (Reuters, 3 October 2018). Though ASWJ-related violence has declined in recent months, there have not been structural changes addressing the roots of the conflict, suggesting that it could surge again. Though violent activity by the state has been limited in Cabo Delgado, it too has undergone a shift since the emergence of ASWJ in October 2017. 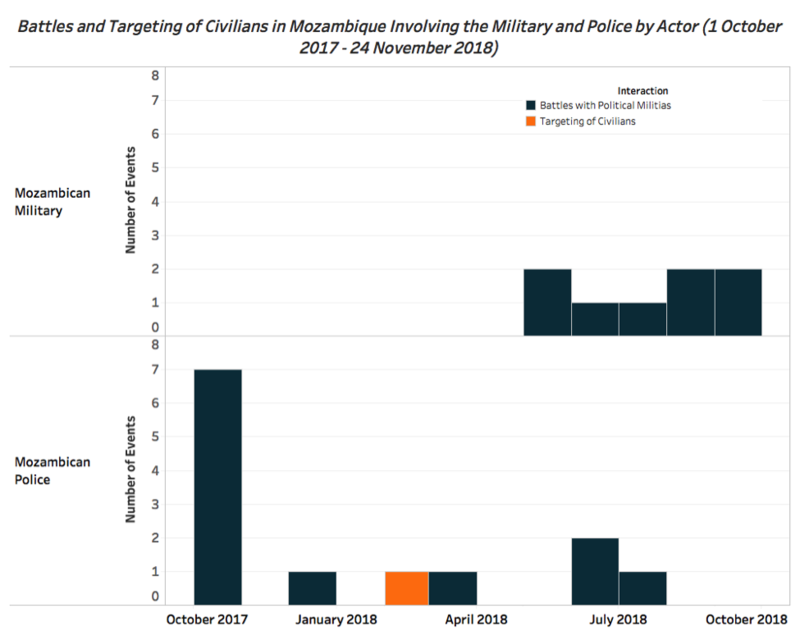 In May 2018, the military became active in the conflict, complimenting efforts by the Mozambican police that had been underway since the group’s initial attack. As demonstrated below, since becoming active in the conflict, the Mozambican security sector has engaged in little violence against civilians. Efforts against ASWJ have often been marked by mass arrests – which could undermine efforts to work cooperatively with Cabo Delgado residents (MSN, 13 June 2018). Additionally, persistent levels of violence against civilians at the hands of state forces could erode local trust in the state and drive recruitment into the armed group (United Nations Development Program, 2017). Though the military has not engaged in violence against civilians thus far, this may be a function of the military delegating such activity to unidentified armed groups. A further militarization of the conflict should be approached cautiously and the government should avoid direct or indirect targeting of civilians. The emergence of ASWJ threatens not only the possibility of the development of Mozambican natural gas reserves, but also the security of Cabo Delgado residents. In 2018, the group escalated its use of violence against civilians and expanded the scope of its operations. Quelling the crisis will require the government to cultivate trust with the community while responding to the insecurity. It will also require that the government respond to the legitimate grievances about Cabo Delgado’s level of development and the effects of the development of natural gas reserves in the region.